Update 2017-09-15: The review has been updated to provide current information on the calendars’ page load speed, number of events, and forecast accuracy. Also, since WBPonline.com no longer offers an active Forex calendar, it was replaced with TeleTrader calendar review (do not confuse with the scam broker TeleTrade). After publishing our first extensive comparison of the top Forex calendars of that time, we return to the subject with the information updated to reflect everything that the industry has to offer in 2016–2017. Technical analysis is the statistical study of market data (price, volume, etc. ), while fundamental analysis is the study of factors that affect the supply and demand of any asset. Many Forex traders use a mix of fundamental and technical analysis to make their trading decisions. To perform fundamental analysis, there is a need for access to precise economic data. Furthermore, to stay ahead of the competition (retail traders, banks, funds, etc. ), the economic data should be delivered at lightning speed. Only a handful of traders can spend a lot on subscription based desktop delivery of economic data. Most of the retail traders are dependent on free sources of economic data. In this regard, there are several finance related websites, including those of Forex brokers‘, which provide real-time economic data in the form of a calendar. Barring the color combinations, most of the economic calendars have little difference between them. However, there are some unique economic calendars, which offer certain degree of advantage to a trader. The aim of this article is to make an unbiased review of those calendars to identify their individual strengths and weaknesses. For the assessment, we have selected the following 10 websites that offer unique economic calendars. The nature of the economic event and the data (actual, forecast, and previous) pertaining to the event make up the core of all the economic calendars. Through various ways of visualizing, the calendars of all the websites indicate the probable degree of impact of an event on the financial markets. Generally, websites use special characters, colors, and universally accepted codes for simplicity, ease of interpretation, and clean looks. For visitors who are not adept in those codes, a legend is provided for quick reference. Devoid of DailyFX, all other calendars, which we have taken for research, use a legend to assist the visitors. Calendars use the currency ISO code, country flag, or country ISO code to link a country’s currency with the appropriate economic data. BabyPips.com utilizes country flags and 3-letter currency ISO codes. DailyFX utilizes only the country flags. 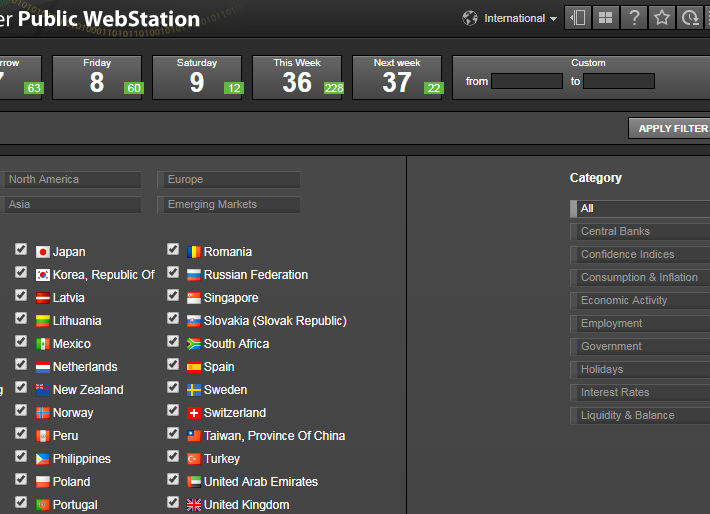 Dukascopy utilizes country flags and 3-letter currency ISO codes. Econoday employs only country flags and 2-letter country codes. For indicating the European Monetary Union, the calendar uses 3-letter (EMU) code. Forex Factory uses only 3-letter currency ISO codes. FXStreet employs a country flag along with 3-letter currency ISO code. Investing.com uses a country flag along with 3-letter currency ISO code. Trading Economics uses country flags along with 2-letter country codes. TeleTrader displays info using country flags. ZuluTrade makes use of 3-letter currency ISO codes. BabyPips.com offers a basic description of most of the indicators along with a link to the official source of data if available. DailyFX provides only a basic description of the important indicators. The calendar also offers a link to the section of the discussion forum where the corresponding event is discussed. Dukascopy provides only the basic explanation of important indicators, frequency of news release, name of the data source, alternative name/significance of the event, and a historic chart with a maximum lookback period of two years. Econoday gives detailed explanation of the indicators, historic chart without revised data, release schedule, last released data, and in-depth study of recently released data. There is also a quick link named “why investors care”, which describes the importance of the indicator for the economy. The link provides additional details such as the frequency and approximate time of release, original data source without a link, feasibility of revision, and finally the month to which the data corresponds. 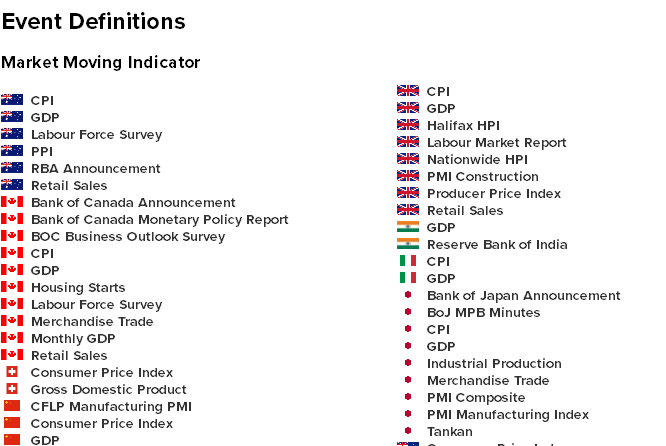 Forex Factory shows an elaborate explanation of the indicators, link to the official source page, historic data/chart, link to the related news, the next economic data release date, alerts (using star symbol) on changes in data announcement schedules, and the nature of the indicator (leading or lagging) or alternative name. FXStreet provides a definition of the indicator, link to the official source page, historic chart, market impact chart (refer to the Extra Features section), link to a user guide explaining the features of the market impact chart, and links to related news. Investing.com offers a basic description of the indicator, latest release date, probable impact on the market, link to the official source page, and historic data/chart. 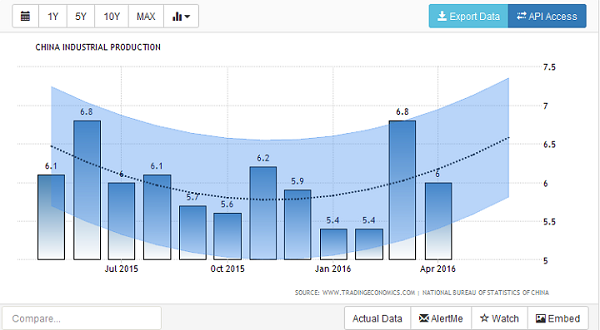 Trading Economics offers detailed explanations of the indicators, subsequent release date, historical chart (quick chart view is offered in a column adjacent to forecast data), past three data announcements in a tabular column, related news, and only the name of the data source. TeleTrader provides a basic description of the indicator, probable impact on the market, and link to the official source page. ZuluTrade does not offer any additional details related to the economic event. 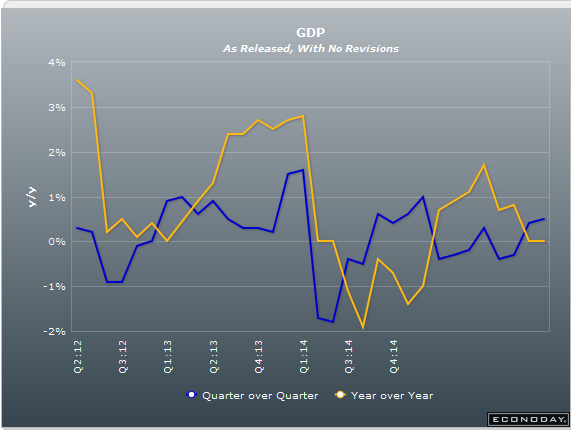 Historic data assists in the study and interpretation of the economic data announced recently. Most of the charts show some amount of historical data related to the concerned economic event. However, the level of interaction possible with the chart provided by one economic calendar and the other varies considerably. This section makes an attempt to assess the quality of the charts provided by various economic calendars. BabyPips.com does not offer charts. DailyFX does not offer charts. TeleTrader does not offer charts. ZuluTrade does not offer any charts. Most of the actual estimates from the government bodies are calculated using the partial data. The reason is that the market is always in an urgency to know how the economy is faring. Thus, government institutions perform a delicate balancing act to release the actual data a little earlier. This causes a revised data to be issued later. The sign of the previous and revised data is usually the same. Only the absolute values differ. When a new data is announced for an indicator, simultaneously, the revised value (corresponding to the previous week or month) for the same economic indicator is released. Most of the economic calendars display such revised information with a different color. There are also calendars which provide both revised and unrevised values for trader’s convenience. The approach of different economic calendars to revised values is explained below. BabyPips.com does not show revised values. DailyFX shows only the revised value. Econoday provides the previous and revised value in a grey background. Forex Factory gives the revised value alongside a yellow colored triangle. Moving the mouse pointer over the triangle would reveal the previous value. FXStreet displays the revised value alongside a yellow colored round dot having the letter ‘i’ (possibly referring to initial value) at its center. Again, in this case, the previous value is revealed by placing the mouse pointer over the round dot. Investing.com shows the revised value with a dotted line underneath it. If the revision is positive, then the numeric data are shown in green color. If otherwise, the data are shown in red color. Placing the mouse pointer above the data reveals the value announced earlier. Trading Economics uses a circled ‘R’ symbol next to the revised value. As usually, mouse pointer can be used to read the unrevised data. Trading Economics, however, does not assess the data logically. It simply considers the lower value (relative to forecast) as negative and higher value as positive. For example, the Spanish unemployment change data released on June 2nd, 2016 was -119.8K. The estimates were -110K. While FXStreet, Forex Factory, and Investing.com reported it as positive, Trading Economics used plain math to determine the data as negative. The value is indicated in red color only in that economic calendar. TeleTrader displays only the original values. Revised values are not shown. ZuluTrade displays only the revised value. The only exception is Dukascopy, which does not show the revised values. Using a filter, a trader can prioritize the list of events to monitor as per the personal need. Almost all the calendars offer the following three basic filters. We shall look at the specific filters offered by each of the economic calendars taken here for assessment. BabyPips.com allows filtering based on currency, impact, and session (London, New York, Tokyo, Sydney). The currency filter offers a selection of 9 currencies (AUD, CAD, CHF, CNY, EUR, GBP, JPY, NZD, and USD). By default, all the currencies, news events, and sessions remain selected. 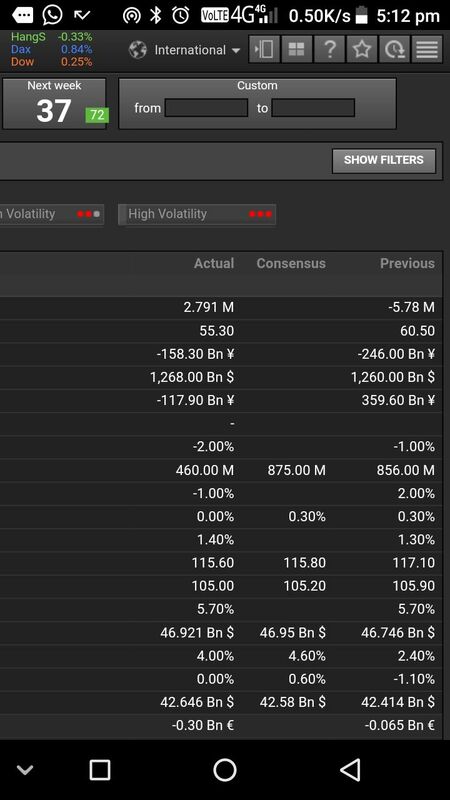 However, ‘Remember Filters’ option can be used to display a trader’s choice of currencies and events pertaining to a single or multiple sessions. 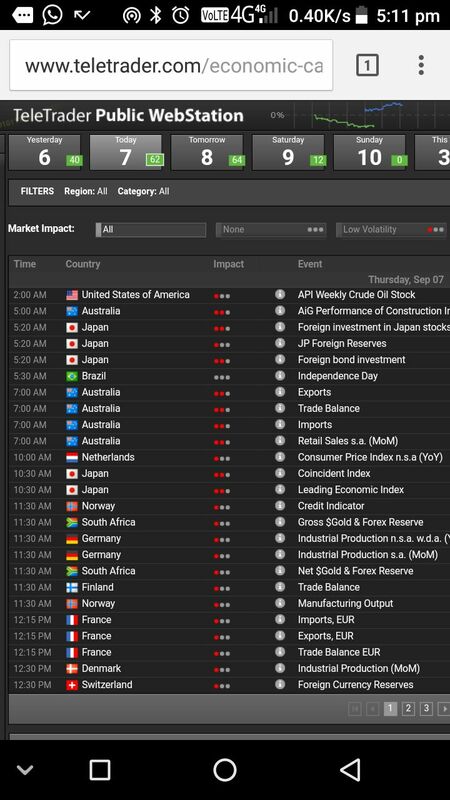 Daily FX supports only currency and impact based filtering. It does not offer an event based filter. However, keyword based event search facility is provided. In total, nine currencies are provided in the filter list. They are: USD, GBP, CAD, JPY, AUD, CNY, EUR, CHF, and NZD. Dukascopy offers currency, impact and event based filter. There is also a provision to perform keyword search. In all, 22 currencies are listed in the currency filter. They are: HUF, ISK, GBP, ZAR, SEK, KRW, CHF, CAD, AUD, PLN, RUB, INR, USD, NZD, TRY, ARS, EUR, BRL, DKK, CNY, JPY, and MXN. Econoday does not offer country/currency, event or impact based filter. However, they offer the facility to switch between the US and global calendars. Forex Factory offers currency, impact, and event based filter. 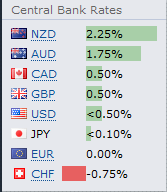 There are 9 currencies in the filter: AUD, CAD, CHF, CNY, EUR, GBP, JPY, NZD, and USD. 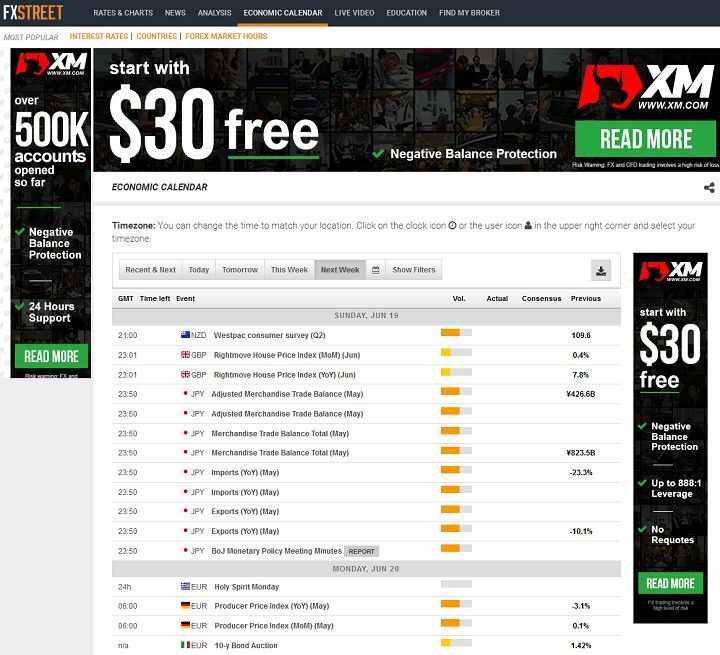 FXStreet, similar to Investing.com, offers all the three (country, impact and event) filters. The impact filter is denoted as ‘Volatility’. The calendar also offers a keyword based event search facility. There is also a custom date filter. Some of the economic calendars do not allow event based search between two specific dates. This facility overcomes that issue. For example, using the filter and without registration, as shown in the image below, we segregated nonfarm events between May 2015 and August 2015. We were unable to perform a similar search using Investing.com (calendar resets to current date). There are 41 countries and one monetary union in the country filter. Argentina, Australia, Austria, Belgium, Brazil, Canada, Chile, China, Colombia, Czech Republic, Denmark, European Monetary Union, Finland, France, Germany, Greece, Hong Kong SAR, Hungary, Iceland, India, Indonesia, Ireland, Italy, Japan, Mexico, Netherlands, New Zealand, Norway, Poland, Portugal, Romania, Russia, Singapore, Slovakia, South Africa, South Korea, Spain, Sweden, Switzerland, Turkey, United Kingdom, and United States. 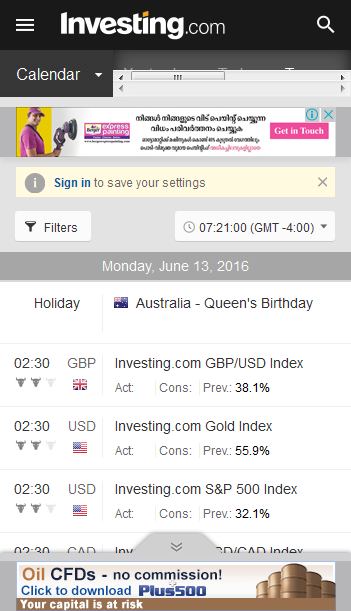 Investing.com offers all the three (country, impact and event) kinds of basic filters. Furthermore, there is also a time based filter to view the actual display time or the time remaining for the announcement. Even event based keyword search is possible. There are 87 countries and one monetary union in the country filter. Argentina, Australia, Austria, Bahrain, Belgium, Bosnia-Herzegovina, Botswana, Brazil, Bulgaria, Canada, Chile, China, Colombia, Costa Rica, Croatia, Cyprus, Czech Republic, Denmark, Ecuador, Egypt, Estonia, Euro Zone, Finland, France, Germany, Greece, Hong Kong, Hungary, Iceland, India, Indonesia, Ireland, Israel, Italy, Japan, Jordan, Kenya, Kuwait, Latvia, Lebanon, Lithuania, Luxembourg, Malawi, Malaysia, Malta, Mauritius, Mexico, Morocco, Namibia, Netherlands, New Zealand, Nigeria, Norway, Oman, Pakistan, Palestinian Territory, Peru, Philippines, Poland, Portugal, Qatar, Romania, Russia, Rwanda, Saudi Arabia, Singapore, Slovakia, Slovenia, South Africa, South Korea, Spain, Sri Lanka, Sweden, Switzerland, Taiwan, Tanzania, Thailand, Tunisia, Turkey, Uganda, Ukraine, United Arab Emirates, United Kingdom, United States, Venezuela, Vietnam, Zambia, Zimbabwe. 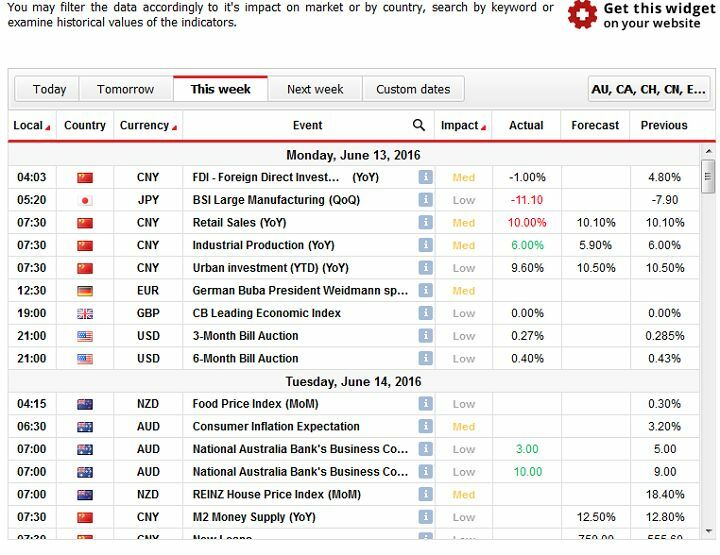 Trading Economics offers country and impact based filtering. In the country filter, two groups, namely ‘G20’ and ‘World’ are only available for selection. There is no checkbox facility to select a group of countries as per the user’s choice. Other than that, a list of 11 countries (including BRIC) and one monetary region are provided for quick selection. The list of 11 countries and the monetary region is as follows: United States, Euro Area, Japan, United Kingdom, Germany, France, Australia, Canada, China, India, Brazil, and Russia. Finally, there is also a summation symbol to view the event data of almost any country in the planet (for example Vanuatu). 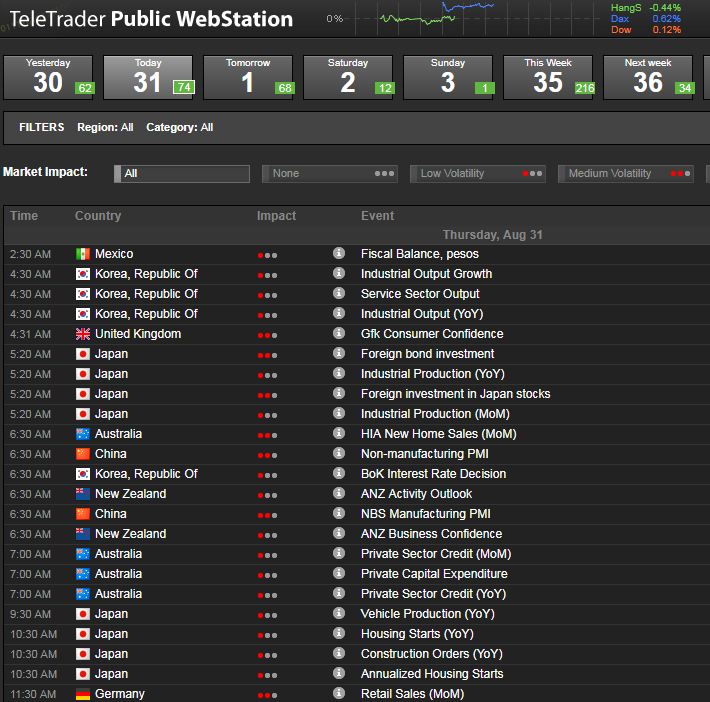 TeleTrader allows filtering based on event impact, region (North America, Europe, Asia, and Emerging Markets), and country. In all, 51 countries and one monetary union (eurozone) are provided in the country filter. Argentina, Australia, Austria, Bahrain, Belgium, Brazil, Canada, Chile, China, Colombia, Czech Republic, Denmark, Egypt, Estonia, Finland, France, Germany, Greece, HongKong, Hungary, Iceland, India, Indonesia, Ireland, Italy, Japan, Korea, Latvia, Lithuania, Mexico, Netherlands, New Zealand, Norway, Peru, Phillipines, Poland, Portugal, Qatar, Romania, Russian Federation, Singapore, Slovakia, South Africa, Spain, Sweden, Switzerland, Turkey, UAE, UK, and USA. A trader can also filter the economic events on the basis of the source of information or the nature of information. The categories include central banks, confidence indices, consumption and inflation, economic activity, employment, government, holidays, liquidity and balance, and interest rates. ZuluTrade does not offer an event based filter. Only currency and impact based filtering is possible. The currency filter includes nine fiat currencies (USD, EUR, GBP, JPY, AUD, CAD, NZD, CHF, and CNY) along with a ‘Global’ currency that symbolizes the world economy at large. A trader may or may not be located in the same time zone used by the economic calendar to display the schedule of economic announcements. Thus, it is a necessity for the Forex calendars to display their active time zone or allow synchronization of the server time with the computer’s clock. The economic calendars tackle the issue in the following manner. 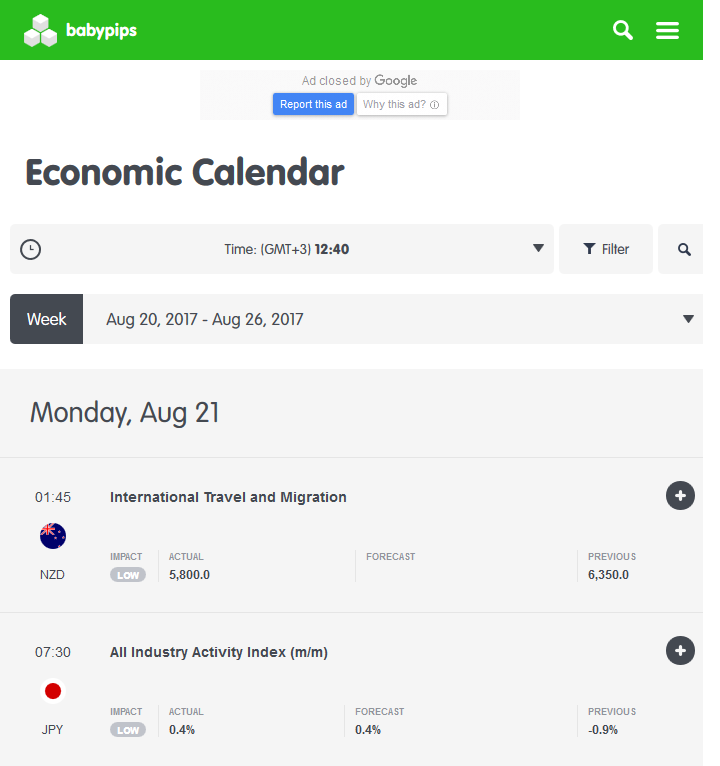 BabyPips.com — detects local time and uses it to display the events schedule. The local time settings can be changed using the drop down menu, but cannot be saved permanently. DailyFX — automatically detects local time and uses it for displaying the schedule of event announcements. The settings can be changed using the drop down arrow, but cannot be saved. Dukascopy — detects and uses local time settings to display the schedule of event announcement. Provides provision to toggle between the local and GMT. However, there is no facility to use the GMT settings permanently. Econoday — uses EST/EDT as the default time settings. However, it offers a provision to synchronize the calendar’s time zone with the local settings and save it to the cookies. FXStreet — uses GMT as the default. To change the time settings, one has to login. Needless to say that the website demands registration, indirectly, for time customization. Investing.com — default time zone is EST/EDT. The time zone can be changed, but not saved without registration. 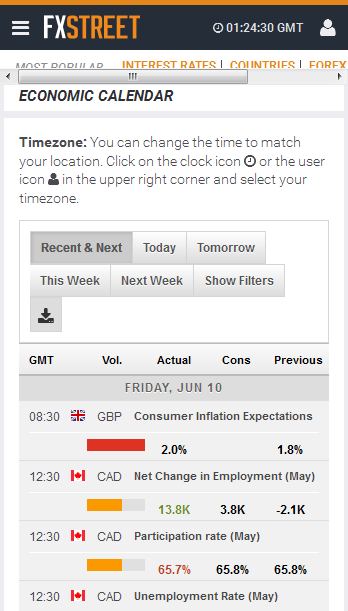 Trading Economics — automatically detects the time zone settings and applies it to the economic calendar. Time customization is possible, but there is no provision for unregistered members to save it. TeleTrader — automatically detects local time and uses it to display the event announcement schedule. 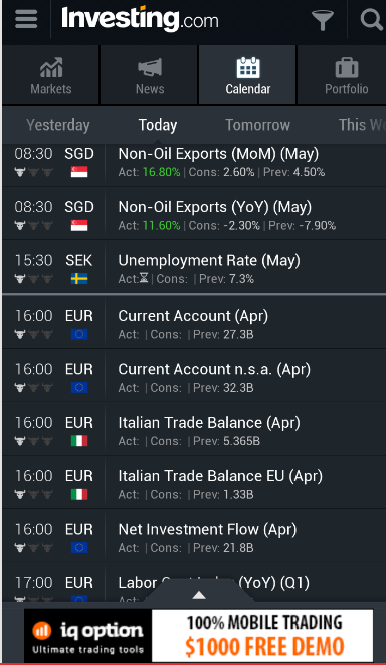 If the time settings are changed using the dropdown menu, then the latest setting (saved in cookies) is used when opening the economic calendar next time. 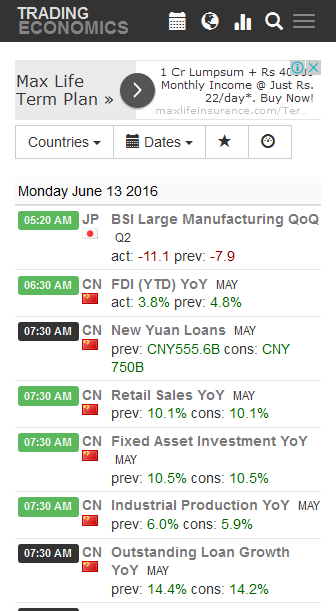 ZuluTrade — automatically detects and uses the local time settings for the economic calendar. However, if necessary, it can be changed and saved using the profile manager. Traders will have a need to browse through past economic data or look at the future schedule of events for a variety of reasons. Thus, every economic calendar strives to offer such a facility, albeit in a different manner. BabyPips.com — the slider can be used to flip through days and weeks. Additionally, the ‘Week’ tab can be used to display events for an entire week. DailyFX — to pick a specific date, a user has to browse through weeks in the calendar. The process would be tedious and frustrating if the trader has to refer data announced several months before. Dukascopy — user can browse through dates, months and years. However, the maximum listing range is 60 days. There is also a provision to manually enter the beginning and ending date. As usually, there are quick links for viewing the events schedule of today, tomorrow, this week, and next week. Econoday — it follows a very simple, yet efficient approach to facilitate calendar browsing. At the top of the event table, four quick links for browsing monthly, weekly, daily, and today’s data are provided. Beneath the quick links, two rows containing sequential dates and months of a calendar year are displayed. 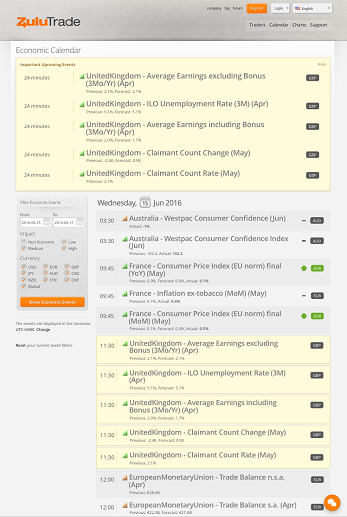 The monthly view displays all the events of a month on a single page, while the daily view shows the event schedule along with the actual, previous and consensus data on the same page. Forex Factory — easy and flexible calendar based browsing facility. It is possible to browse through dates, months and even years. The default week can be set and saved. For quick reference, there are links to visit the week and month that just ended. Similarly, there are quick links to visit the event schedule for the week and month that is about to come. FXStreet — calendar browsing facility is available. There is also a drop down menu to quickly jump to the month of interest. Beginning and ending period can be selected manually using ‘Custom dates’. The event look back period begins from February 2007. There are also quick links to view the events schedule of today, tomorrow, this week, and next week. 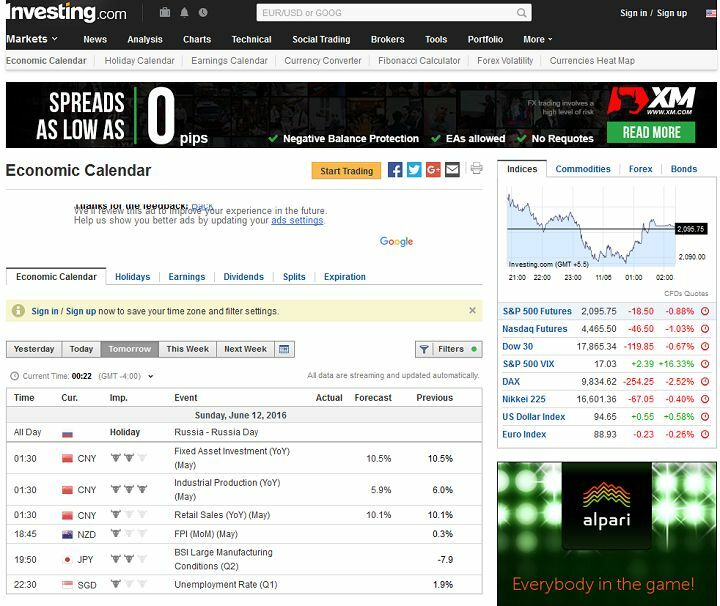 Investing.com — the calendar browsing facility allows a trader to browse through days and months. 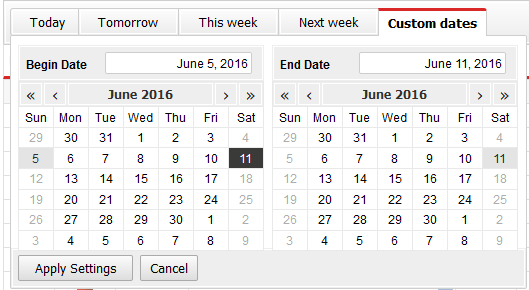 Alternatively, search can be done by manually entering the beginning and ending date in the ‘Custom dates’ column. Trading Economics — calendar browsing facility is not available. However, there is a drop-down menu named ‘dates’, which provides the quick link to view the event schedule of today, tomorrow, last week, next week, and next month. There is also a facility to manually enter the starting and ending date of the event schedule. TeleTrader — the time scale allows quick selection of data pertaining to the previous day, current day, and the next three days. Additionally, a tab to view the entire list of events during the current and next week is available. Using the input box in the custom search facility, a trader can choose the period of interest for studying the economic data. The pop-up calendar in the custom search facility allows flipping through months, but not years. A drawback, which we came across while using the custom search facility, is that the number of events which gets listed is restricted to 250 despite increasing the time period of search. For example, if we are studying the events in the month of March 2017, only the first 250 events are getting listed. Once we reach the tenth page of events, we have to input the new dates to study the rest of the data. A tiny green-colored square box within each calendar date in the time scale provides the number of anticipated events for that particular day. ZuluTrade — the economic calendar of ZuluTrade can only show a fixed amount of events, irrespective of the number of days chosen through the calendar browse facility. This is due to a limitation on the scrolling function. 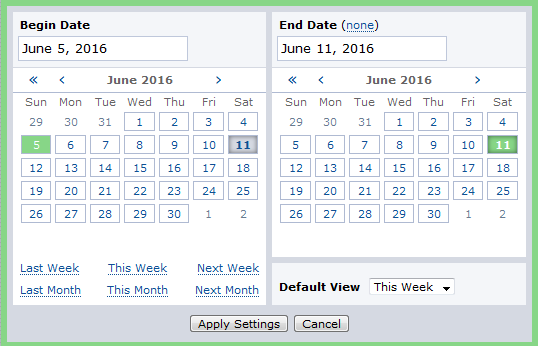 A user can quickly flip through days or months in the calendar. There is also a provision to search events by manually entering the beginning and ending date. There are only two economic calendars that use Monday as the starting day of a week. They are Econoday and Dukascopy. ZuluTrade does not have a weekly view. In the case of Forex Factory, a user can set the first day of a week as per his choice and save it to the cookies. Registered users can save the settings through their profile manager. The rest of the researched websites (except TeleTrader) use Sunday as the first day of a week. Unlike other economic calendars, TeleTrader always uses the previous calendar date to list out the schedule of economic events. Auto-update feature avoids the need to manually refresh a web page to view the latest announcements. The following list of economic calendars offers the auto-update feature. BabyPips.com is not a self-updating calendar. Sometimes, it takes a lot of time to update. As it can be seen below, BabyPips has not updated the German PPI reading (EUR), whereas Forex Factory has updated the event data without any delay. Many a times, traders will have a need to check the event announcements while traveling. Thus, a mobile-friendly website is always preferred by traders using economic calendars. We used RankWatch to validate the 10 websites taken for research. RankWatch provides a page score to the tested website based on factors such as the use of incompatible plugins, text size, content width, availability of mobile viewport, distance between links, presence of app install interstitial ads blocking contents, and responsiveness of the website. The page score and relevant details are given below. BabyPips.com is a responsive mobile friendly site with a score of 99% from RankWatch. It has a mobile viewport installed, and uses an easily readable text size. The mobile page does not use incompatible plugins and the content is not wider than the screen. However, the links are placed close to each other. BabyPips.com no longer offers an app for iOS and Android phones. The last official update, issued in May 2016, states that they will not update the app for the new releases of iOS and Android devices as the company behind the Forum Runner software has discontinued development of the Forum Runner app. Offers a mobile-friendly website with a page score of 99%. There seems to be no app for news and economic calendars in English. However, a freely downloadable Android app in Chinese, having a rank of 3.9, is available. The biggest drawback of DailyFX’ mobile version is that it does not offer the slider for time browsing. All other facilities, including the data (actual, forecast, previous) are presented in a simple and easy to read format. Similar to the desktop version, the mobile webpage does not offer any charts. It manages to remain in the list of mobile friendly websites with a score of just 80% from RankWatch. Dukascopy does not have an app in its own name. However, registered members of Dukascopy can use the app developed by Swiss Forex for Android and iOS devices. Some of the features offered by the app are horizontal mode scrolling charts, market sentiment, pattern radar, commitment of traders and Dukascopy TV. 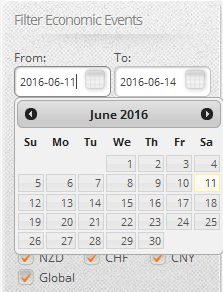 Similar to BabyPips.com, a lot of scrolling is needed to select and study a particular event in the calendar. However, the mobile page offers a better scalable historic chart. The calendar does not look congested. It is certainly a mobile friendly site with a score of 96% from RankWatch. Interestingly, Google Webmaster Tools does not consider it as mobile friendly as the content is wider than the screen. Offers only iOS app for iPhone/iPad. Their official website does not mention about Android app. The app is available free only for the subscribers of MyEconoday. The mobile page loads very quickly relative to other calendars. All the facilities provided in the desktop version are available in the mobile version as well. Furthermore, time browsing can be done quickly. However, a little bit of scrolling is required to study the calendar. MyEconoday offers its iOS version of the app free for the first 15 days. After that, a subscription, beginning at $9.99 per month, is required to receive the event data. The economic calendar resembles that of the desktop version. Event data and description is made available. Pros: The event data can be customized. Furthermore, there is an auto-update feature. The user can even synchronize the calendar time and the local time, and opt for push notifications of events. Cons: Does not offer Android version and subscription is required. It is a mobile-friendly website, but gets only a score of 89% from RankWatch. Offers freely downloadable Android and iOS app. The Android app has a rating of 4.3 and facilitates auto-detection of local time zone, buffer customization (default is 2 minutes), a variety of sound notifications, and filtering based on currency and impact. 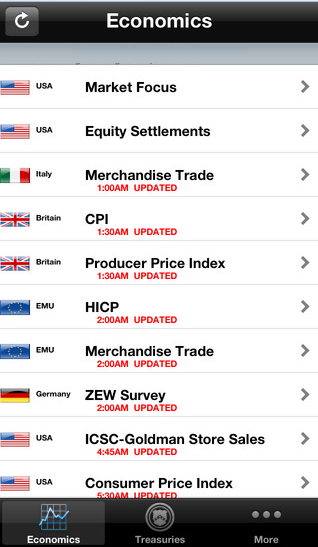 The news update is available for AUD, CAD, CHF, CNY, EUR, GBP, JPY, NZD, and USD. The iOS app, according to a single customer review, lacks an economic calendar and notification facility. In the mobile version, when a user looks at the screen only the actual values pertaining to an event can be seen. 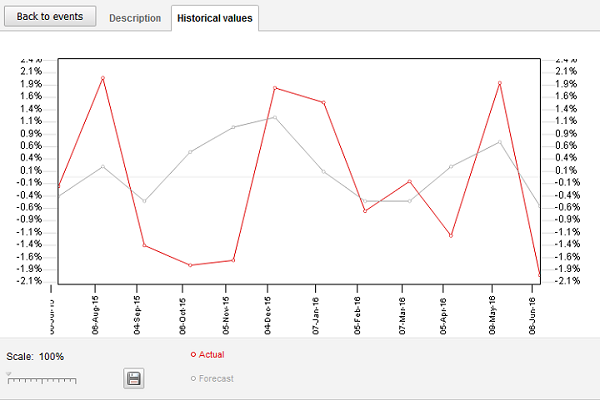 Only by clicking an event, all three values (actual, forecast, and previous) can be studied. In the same manner, the chart and description of the event can be accessed. An exit tab provided with the chart and event description enables going back to the main screen in an easy manner. Forex Factory offers an app with basic features. Both impact and currency based filter are available. Even local time can be set. Pros: The app offers zooming facility. There is also a facility to fast forward/backward the event date. Cons: It does not offer charts. Has no auto-update feature. Offers a mobile version of the website and provides a real-time economic calendar, technical studies and currency pair charts. It can be accessed by typing m.fxstreet.com and touch.fxstreet.com from ordinary mobile and smart phone respectively. The website receives a page score of 94% from RankWatch. FXStreet provides Android and iOS app, which can be downloaded freely from the App Store or Google play. Apart from offering real-time news and data, the app also allows local time zone setting. Even the read news can be saved for later use. A currency based filter is also provided. Similar to Investing.com, the mobile version of the calendar enables users to easily shift from one section to the other using the open menu. However, time browsing is not possible. The historic chart looks clear, but the tabs (true range, volatility ratio, and deviation impact) are organized in a congested manner. 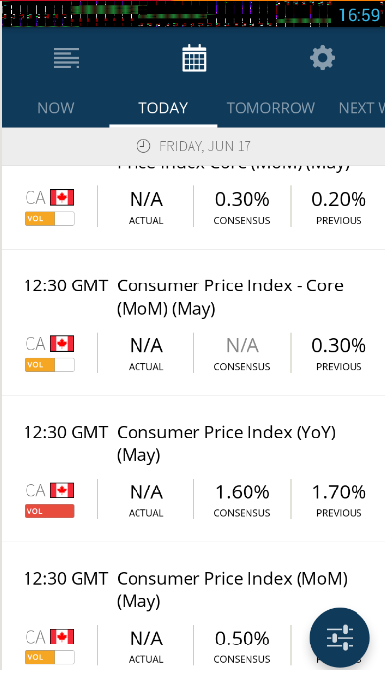 The app offered by FXStreet has a simple layout. The settings menu, provided on the right side of the screen, enable subscription to news updates and changing to local time zone. Two other icons, one for the news and another for the calendar, is provided in the same row where the settings is located. Pros: The font size of event data is bigger. Thus, users will find it very comfortable to read. Filter menu on the lower side of the screen allows easy segregation of requisite event data. Has auto-update feature. Event notification can be set through long tap facility. Cons: The news update is not currently functioning. The website owners have put a message (without any definite time frame) saying that news pagination and stability improvements are currently carried out. The time zone synchronization does not work properly. Time browsing is limited to yesterday, today, tomorrow and the next week. The mobile version of the website offers important sections (news, economic calendar and market quotes) of the desktop website. RankWatch gives the website a rating of 99%, but warns that links are too close to each other. Investing.com also offers freely downloadable Android and iOS app. The Android app has been downloaded more than a million times and carries a rating of 4.6. The mobile version of the website is well organized and easy to browse. The open menu allows users to quickly move between different sections (news, calendar, analysis, portfolio, earnings, top brokers, etc.) of the website without any difficulty. Furthermore, the line spacing ensures comfortable reading without any strain to the eyes. Even filtering of data is possible. The graphs have a neat appearance. They could have avoided the pop-up advertisements, which may irritate the user. 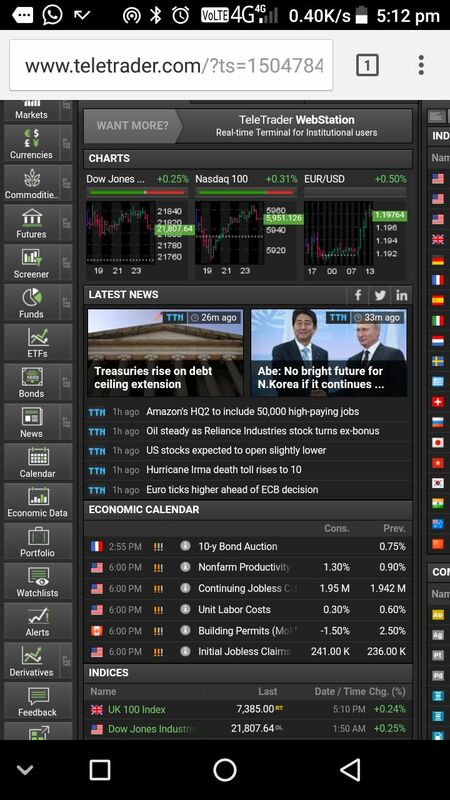 Investing.com covers multiple financial markets (stock, commodities, and Forex) in a single Android app. Data pertaining to more than 40,000 assets traded in 70 exchanges are offered. As of now, the app is offered in 14 languages. Country and impact filter is available. Keyword event search is also possible. The app has auto-update facility. The menu at the top allows switching between different sections such as calendars, news, webinars, and settings. This is apart from the four icons provided at the top of the screen to quickly switch between calendar, portfolio, news and the markets section. 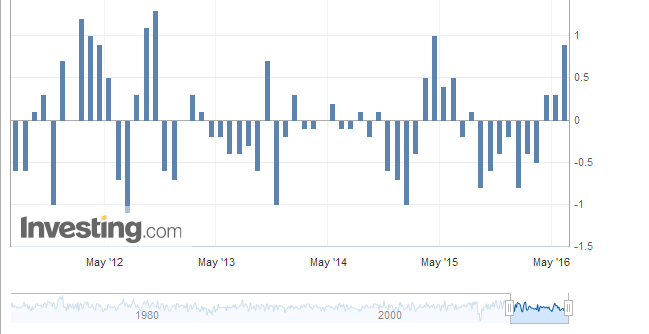 Pros: The economic calendar provides data and charts on a real-time basis. User can also create a custom portfolio to track the performance of financial assets. Apart from alerts for major economic events, live signals are also provided. Cons: The app is little slower in providing the event updates. Large ads are shown during loading. Time browsing facility is restricted to yesterday, today, tomorrow and the running week. Latest feature: The app provides alerts based on price, percentage change and volume. The site is mobile-friendly. It obtains a score of 98% from RankWatch. Closer links are the main issue with this website as well. There is no mention of apps for Android or Apple devices. Offers only Application Programming Interface (API). 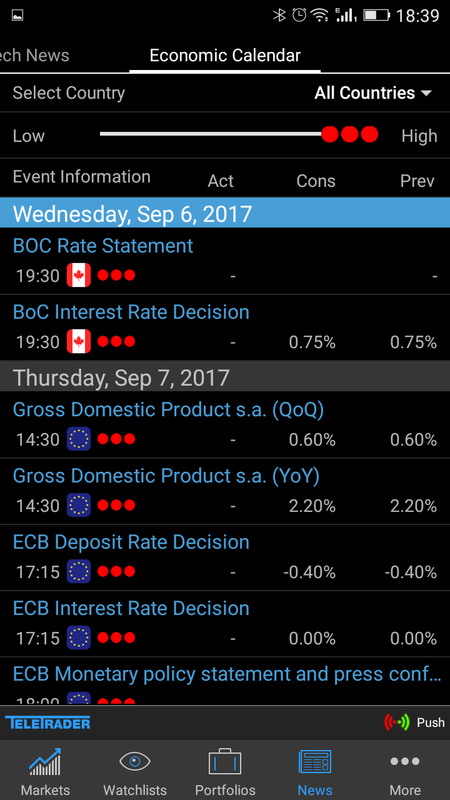 The mobile version uses a good color combination to represent the impact of events on the market. However, when a user clicks to read further details about the event, it opens the page in a new tab. Furthermore, the graph is presented in an extremely compressed manner. It is of practically little use to a trader. Filters, however, can be applied easily. TeleTrader is not a responsive mobile friendly site, according to RankWatch. The website receives a score of only 61%. RankWatch points out that the contents of TeleTrader are wider than the screen and the links are too close. On the positive side, the mobile viewport is set, text is big enough to read, and the website does not use incompatible plugins. TeleTrader offers Android and iOS apps that can be downloaded freely from the App Store or Google play. It allows a user to narrow down the search based on countries. In all, 11 countries (USA, UK, Japan, Australia, Germany, Canada, China, New Zealand, Italy, Korea, and Switzerland) and one economic union (eurozone) are listed. 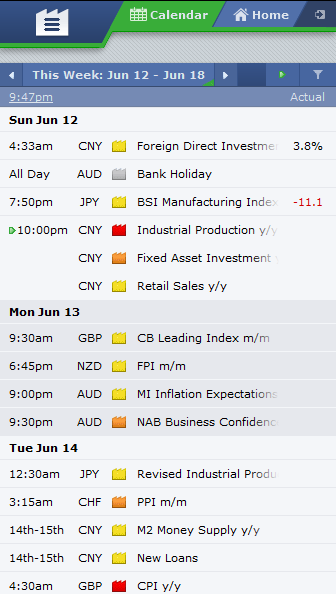 The list of events can also be narrowed based on impact on the Forex market. A brief explanation of the indicator and the link to the data source can be accessed by tapping the event data. Additionally, the app allows a user to set a watchlist, create portfolios, and track multiple financial markets. The app also offers a search facility, currency converter, and screener. It allows viewing the calendar in 13 languages. News notifications can be enabled. Pros: Practically all the financial markets can be tracked. Offers a one-stop solution for all the economic and geopolitical events. Cons: Sometimes we may feel that too much of information is offered. It is also a mobile friendly website with a score of 99%. Close links seem to be the issue with this one as well. Offers app for Apple, Android phones, and Windows (version 8, 8.1 and 10) based phones. The Android and Windows app carry a rating of 4.1 and 4.6 respectively. The mobile version enables browsing the list of suitable traders and picking a suitable one to follow. However, registration is required to access the content. Traders unwilling to register can switch to the normal version of the website. The normal version is a replica of the desktop version. It shows the economic calendar without any restrictions. However, event search for long time periods will not be displayed completely due to restrictions on the page length. ZuluTrade offers an app similar to the desktop version. 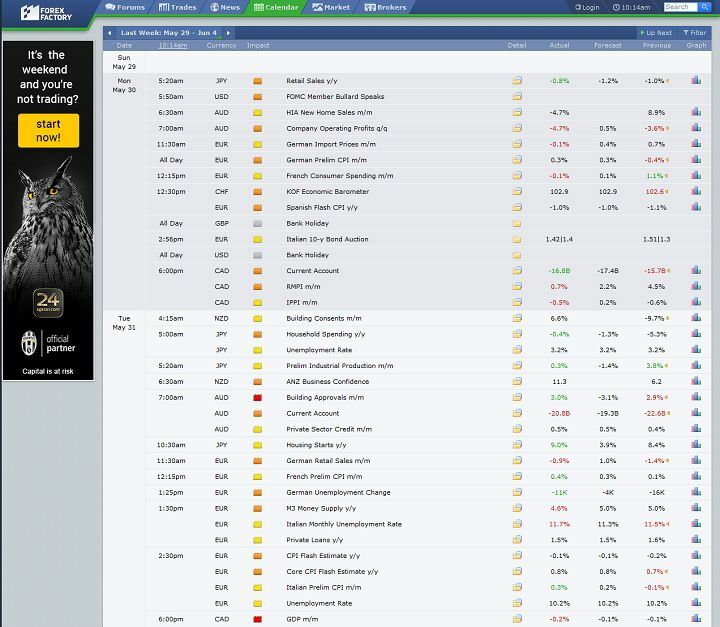 The main menu facilitates switching to the economic calendar. 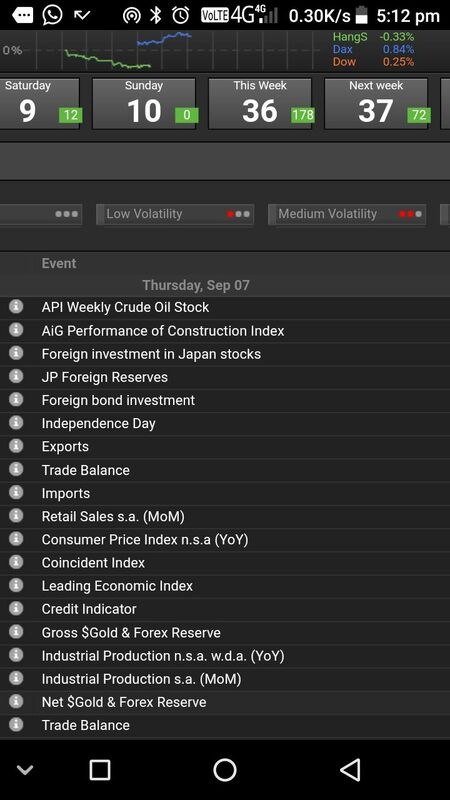 There is also a ‘Today’ button at the top of the calendar screen which enables a trader to quickly go back to the highlighted list of upcoming events. Both currency and impact filter is available. Pros: Alerts (1 minute and 5 minutes before the event) can be set using the alarm icon provided above the time of release of event data. Cons: The event data is provided in grey color. Users would find it difficult to study quickly. Need to tap the event data for better view in a pop-up window. Investing.com, Econoday, TeleTrader, and ZuluTrade should be the website of choice for a trader using mobile frequently to track economic events. Forex Factory deserves the next place. Dukascopy should be the last choice. BabyPips is of no use to a professional trader. A trader having access to fast economic data will naturally have an early entry advantage in the market. The ten websites, which we have taken for research, do not present the data to a user at the same time. Some of them are little earlier than others. FXStreet and Trading Economics provide faster event updates, compared to other websites taken for study. 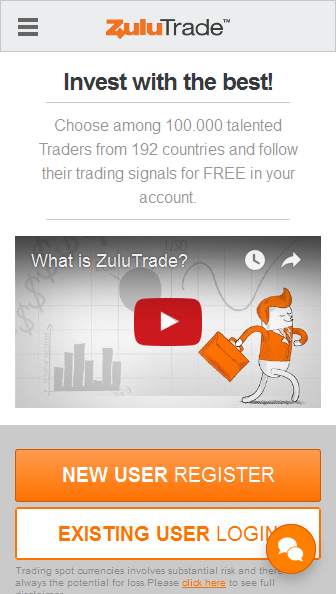 ZuluTrade follows them closely. Since Forex Factory, Dukascopy and TeleTrader do not provide the auto-update feature, it is difficult to track them perfectly. Even though DailyFX claims to offer an auto-update feature, practically, manual refresh serves the interest of a trader. Investing.com and BabyPips.com takes the last two positions when it comes to the speed of event updates. None of the economic calendars offer sound based event notifications. Other alerts offered by the calendars is described below. BabyPips.com — does not offer event notifications of any kind. 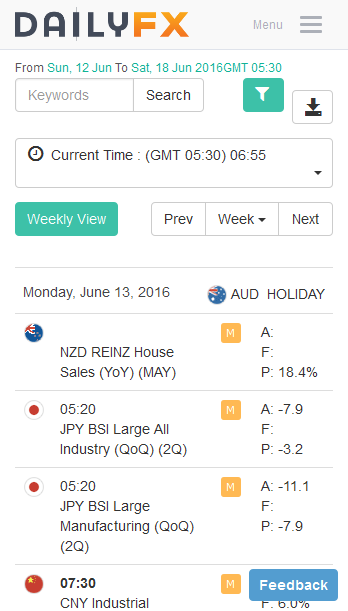 DailyFX — alerts can be created by adding the events to Google, Yahoo, iCal or Outlook calendar. Forex Factory — does not provide any kind of event alerts. FXStreet — provides updates through Microsoft Outlook or 30boxes.com. Investing.com — web and mobile app based notifications are available. The user should remain logged in to receive the alerts. Frequency of notification (once or recurring) can be set. Trading Economics — provides email alerts. TeleTrader — does not provide any kind of alerts. ZuluTrade — does not provide any kind of event alerts. The economic calendar has value only if it loads quickly. In this regard, the performance of all the ten researched web sites is assessed using the service of WebPageTest. The websites were tested using six different geographical locations: US East Coast (Dulles, VA, USA), US West Coast (San Jose, CA, USA), South America (Buenos Aires, Argentina), Europe (London, UK), Asia (Tokyo, Japan) and Oceania (Sydney, Australia). Using Firefox browser, the time taken for each website to load (first view, in seconds) from the six locations and the average load time is summarized in the table below. From the above table, it can be understood that Econoday leads all other websites as far as the calendar access speed is concerned. Forex Factory, which takes the second position with an average load time of about 5 seconds is rather slow in Asia and Oceania. Investing.com does not fare well in any of the locations. Maybe they should optimize their calendar page layout and remove some bloated scripts. Those living on the East Coast may appreciate the response time of Trading Economics. ZuluTrade could be another good choice for the US East Coast traders. On the other hand, West Coast dwellers would find Forex Factory a better choice after Econoday when it comes to calendar loading time. TeleTrader is not too bad in Europe. A news trader will be naturally inclined to look for a calendar which offers the maximum number of events. 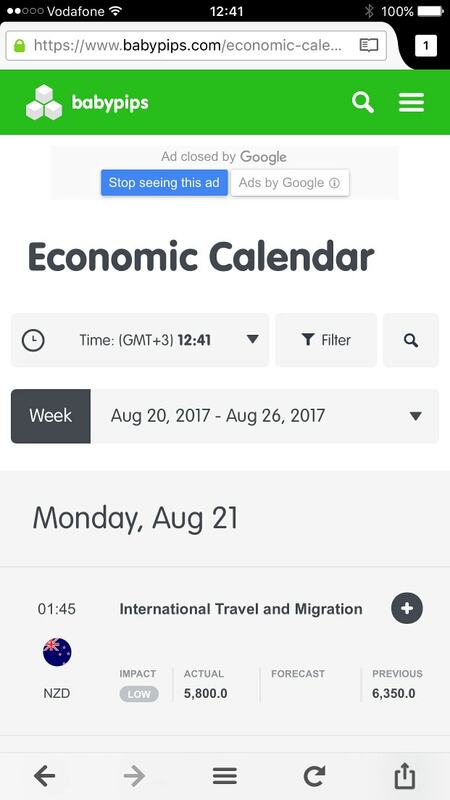 While the economic calendars do not miss out any major currency, they curtail the number of news events listed in their economic calendar. Since there is no provision for a user to add a news event to an economic calendar, it becomes all the more important to select an economic calendar that offers the maximum number of news events relevant to a news trader. In this regard, we have calculated the number of events provided by the 10 calendars for the four major currencies (EUR, JPY, GBP, and USD). The calendar month used for assessing the completeness of an economic calendar is August 2017. The definite leader in providing the maximum amount of economic data is DailyFX. On the other hand, BabyPips.com, Forex Factory, and Econoday certainly seem to suit only those traders who focus on major news events. Quite often a trader will come across differences in the event forecast data released by two different calendars. Usually, there will be a difference only in the absolute value of an event forecast data. The sign preceding the absolute value will not contradict. The use of different primary data source contributes to the difference in the forecast value. There are two rows for Trading Economics in the table above. Their calendar offers two different values for each prediction — Consensus forecast (similar to most other calendars), and an in-house analytical forecast. The latter turns out to be the most inaccurate on average. The error margin of DailyFX is the lowest. It is closely followed by the calendars of BabyPips.com and Forex Factory. The forecast accuracy of the rest of the calendars is a little bit lower. It is also obvious that FXStreet, Investing.com, Trading Economics, TeleTrader, and ZuluTrade use the same forecast source (the only difference was with Investing.com March value). A Citi Group’s survey conducted in 2014 estimated that there are about 4 million traders worldwide. Of those, only 150,000 traders reside in the USA. Almost 1.4 million traders live in Europe, while 1.6 million traders live in Asia. Thus, it is clear that most of the traders do not have English as their native language. To assist traders in reading through economic calendars, top rated Forex related web sites offer translations to other languages. Let us check, how far it is the case with the calendars we have taken for research. BabyPips.com does not offer the website in any language other than English. DailyFX offers its service in Spanish, French, Chinese, German, Italian, Arabic, and Greek. Dukascopy offers only an interface in languages other than English. The supported languages are French, German, Russian, Spanish, Chinese, Japanese, Portuguese, Latvian, Polish, Arabic, Czech, Farsi, and Slovak. Econoday does not provide translations in any other languages. Forex Factory offers web site only in English. 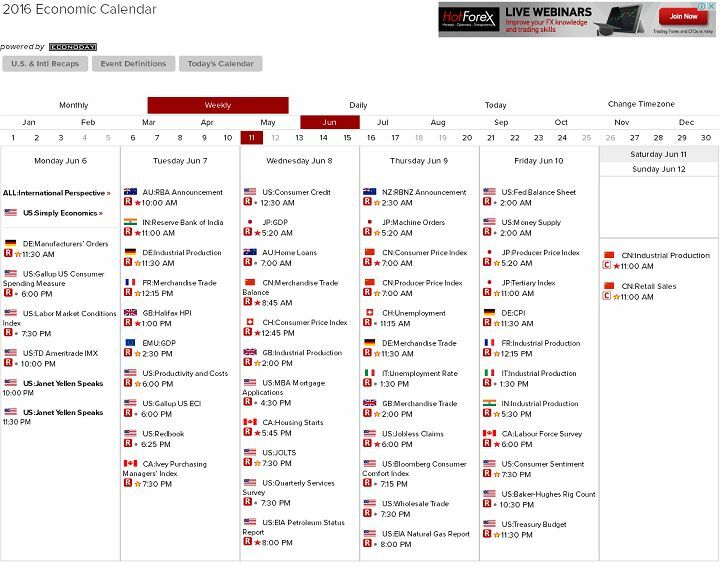 FXStreet offers its website and the economic calendar in 16 languages apart from English. The languages are Spanish, Chinese (simplified & traditional), Russian, Arabic, Indonesian, Turkish, French, German, Japanese, Italian, Portuguese, Vietnamese, Hungarian, Korean, and Catalan. Investing.com offers complete website in German, Spanish, French, Italian, Dutch, Polish, Portuguese, Russian, Turkish, Arabic, Greek, Swedish, Finnish, Hebrew, Japanese, Korean, Chinese, Bahasa (Indonesian), and Malay. Trading Economics provides services in Spanish, Portuguese, French, German, Italian, Russian, Danish, Polish, Svenska (Swedish), Norwegian, Finnish, Turkish, Magyar (Hungarian), Farsi (Persian/Iranian), Indonesian, Malay, Swahili, Chinese, Japanese, Korean, Hindi, Bengla, Arabic, and Urdu. The event details can be read in the listed languages. However, the description is not provided. 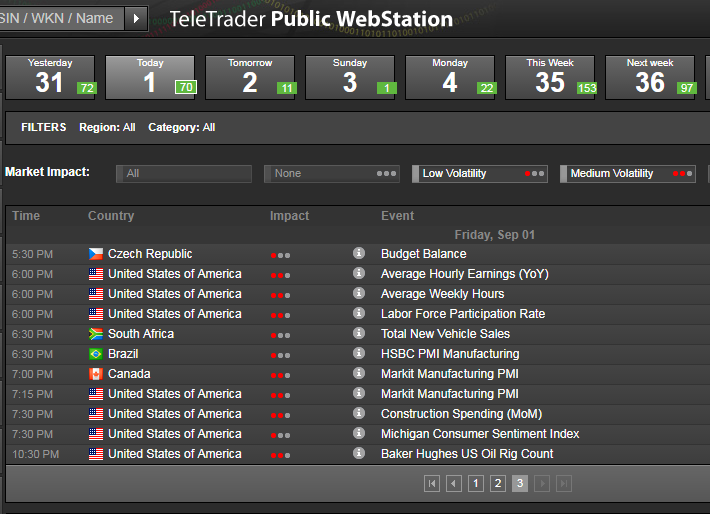 TeleTrader offers its website and interface in English (US/UK), German, Hungarian, and Polish. Another notable feature is that the list of events gets narrowed down automatically, reflecting the region in which the language is spoken. For example, selecting German or Hungarian language would result in listing events in Europe. If we select US English, only events related to the American continent are listed. We wonder how will a Polish (or Hungarian, etc.) 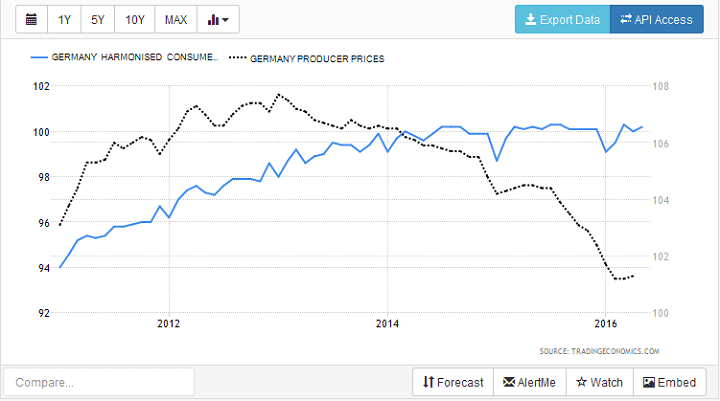 trader, who cannot understand English, track the US economic data without the use of the Polish language interface. 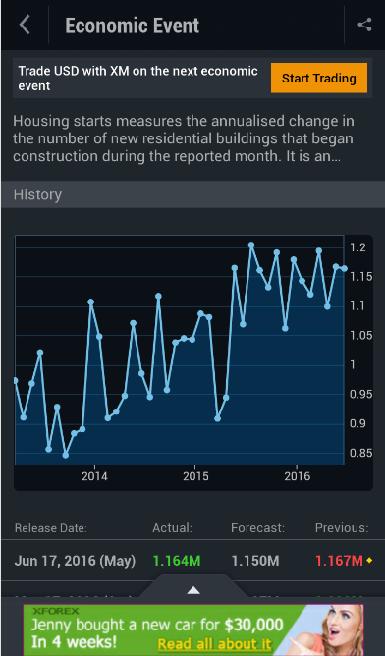 If the language settings are changed using the dropdown menu, then the latest setting (saved in cookies) is used when opening the economic calendar next time. ZuluTrade provides interface level translation in Russian, Japanese, German, Chinese, Spanish, French, Polish, Bulgarian, Czech, Danish, Greek, Finnish, Hebrew, Magyar (Hungarian), Korean, Malay, Norwegian, Portuguese, Slovenian, Svenska (Swedish), Siamese (Thailand), and Vietnamese. Trading Economics leads the fray. It is closely followed by Investing.com and FXStreet. ZuluTrade does not offer translation in totality. So, it stands behind others. Some calendars offer extra features which deserve to be mentioned. The list compiles the additional features, if any, in each calendar being researched. 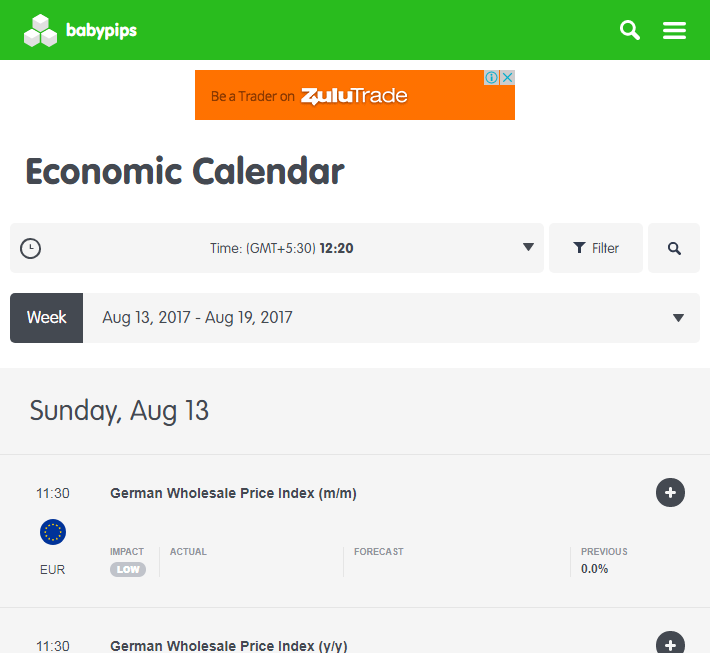 BabyPips.com — the ‘Day’ tab facility provided above the calendar slider enables a trader to quickly revert back to the current date. 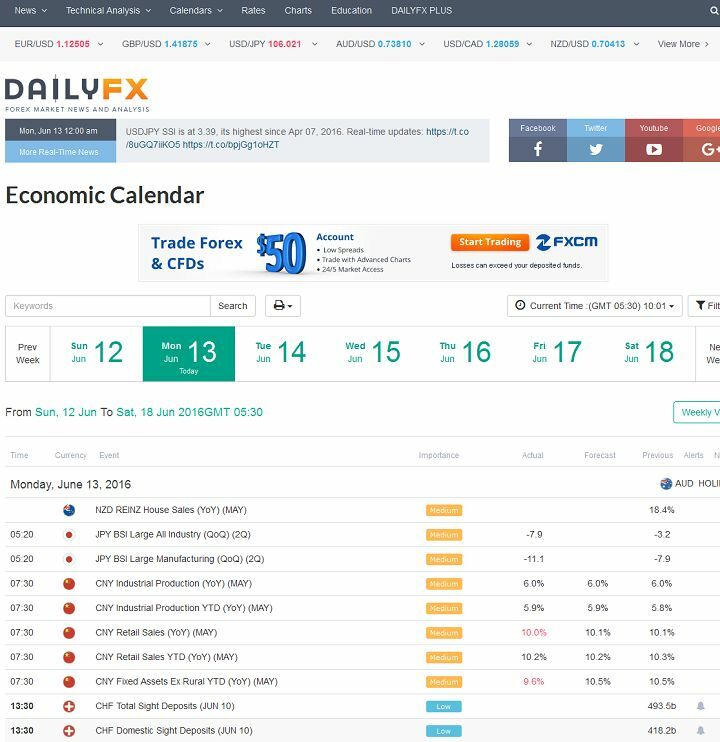 DailyFX — provides a Central bank calendar. All events have the country ISO code affixed to it. That makes it easy for keyword search (in case there is a doubt about the exact name of the event). Econoday — offers a separate link for event definitions. It allows a trader to quickly refer to the details regarding a particular event. While most of the professional traders will have no hesitation to explain what a “nonfarm payrolls” data is all about, it will not be so when there is a query about “Gallup good jobs rate”. The event definitions would be useful precisely in such a scenario. Forex Factory — displays the Central bank rates in a sub-window for quick reference. FXStreet — offers deviation impact study. Using the facility, a trader can understand whether an economic data surprised the market in the past, compared to the expectations. The explanation of the chart (as provided by the website) is provided as a screen shot underneath. The calendar also offers true range, volatility ratio, and deviation impact charts for currency pairs such as EUR/USD, USD/JPY, GBP/USD, AUD/USD, and USD/CAD. The calendar also segregates the concluded events by a tick mark. Investing.com — offers the facility to monitor the time remaining for the next news announcement. There is also a quick link to the holiday calendar. Trading Economics — allows creation of custom watch lists. Chart based comparison of an event with another (selective list) is also possible. TeleTrader — using the left block button provided at the top right corner of the website, a trader can keep himself abreast of the latest geopolitical news across the globe. 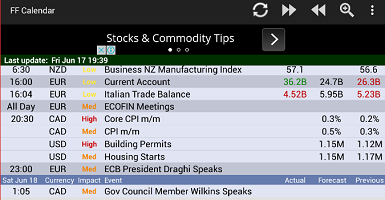 The button can also be used to hide the news and view only the economic calendar. 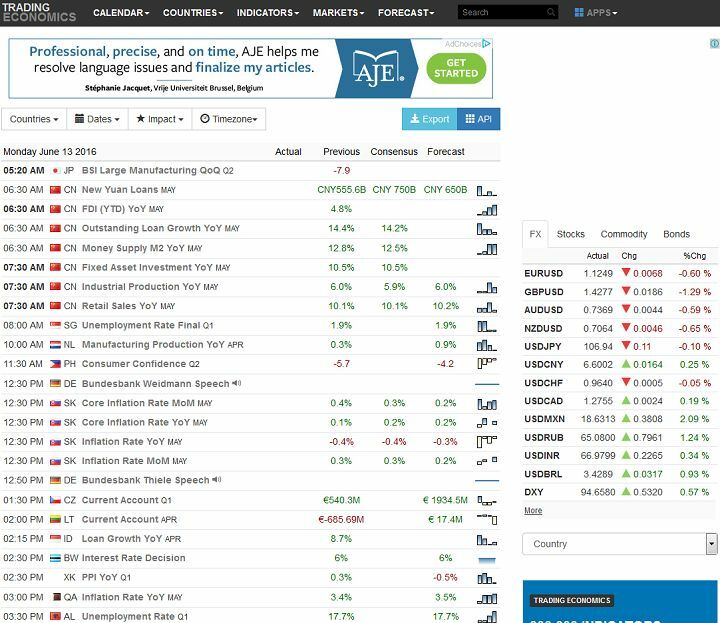 The search facility on the top left corner of the website can be used to track a single currency pair and to study all the relevant details: weekly/monthly/quarterly/5-year performance, monthly/quarterly/yearly high and low, average weekly/monthly/semiannual/annual price and volume, monthly/semiannual/annual/3-year volatility, rates quoted by multiple brokers, charts with timeframe ranging from intraday to 10 year, and the latest news pertaining to the currency pair. A user can also search based on a combination of currency and region. TeleTrader also provides an ocean of details pertaining to other financial markets. The data can be accessed through the tabs provided on the left-side. 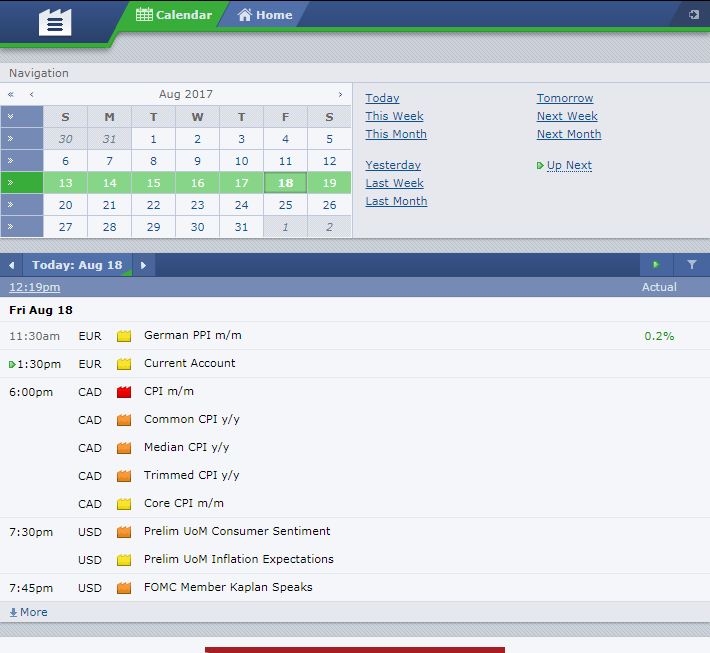 The favorites tab or the star shaped button in the top-right corner can be used to save a particular section (e.g., economic calendar) for quick access in the future. TeleTrader also provides the user’s navigation history for future reference. ZuluTrade — highlights the next event for which the data will be announced, and additionally displays it above the event list. If you are a trader with a habit of using a clipboard to track economic events, then a print friendly economic calendar would be very useful. At the least, there should be a facility to export the economic calendar to any other print friendly format. DailyFX — facilitates export of calendar in PDF and XLS format. 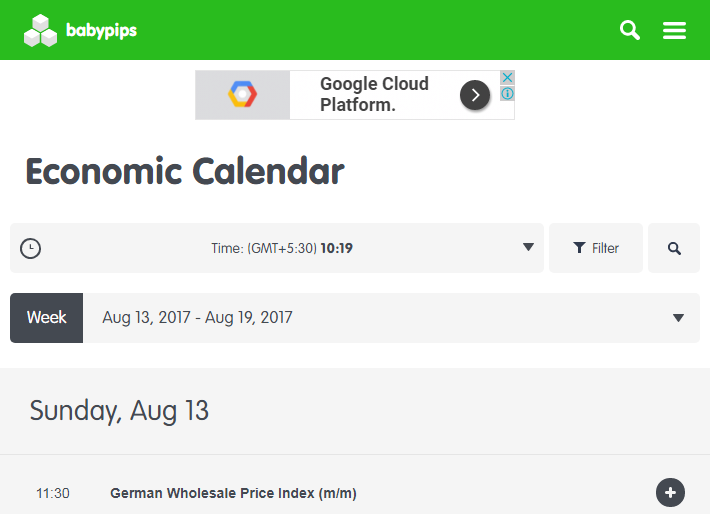 Econoday — provides only print-friendly view of its calendar. 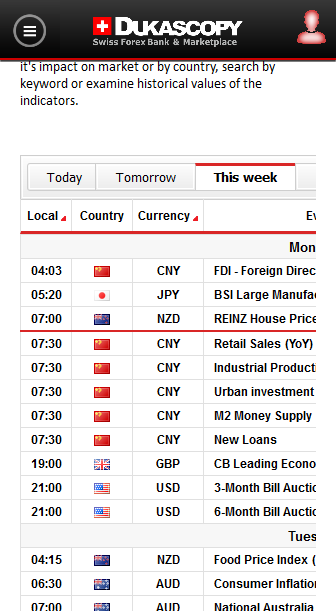 Forex Factory — provides only print-friendly view of its calendar. FXStreet — allows export of calendar in CSV and ICS format. Investing.com — economic calendar can be printed. Trading Economics — allows data export by paid subscribers only. You are looking for a simple calendar with basic features. reverting back to the current date. You are looking for a calendar which does not look congested. You are not particular about the event type filter. You do not want a long list of events. Printing or exporting the macroeconomic data is not your priority. You can read and understand English very well. You wish to track a large number of events. You have a need to refer Central bank rates frequently. You do not wish to look back into historical data often. You wish to know the frequency of an announcement. You wish to view the historic chart with actual and forecast values. You are not bothered about the revised values. You are not bothered about forecast accuracy. You do not want to print or export the calendar. You want a simple distraction-free calendar. You wish to have a detailed description of events. You want to browse through days, weeks and months very quickly. You would like to monitor only the most important events. You are not looking for an auto-update feature. 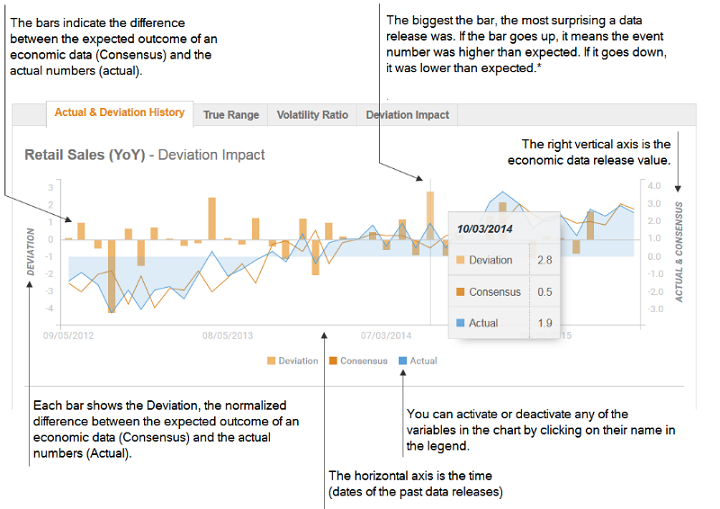 You want a detailed explanation of the indicators. You regularly use historic graph/data. You are looking for well organized and clean looking calendar. You do not want to stare at the long list of events. You want to filter events simultaneously with keyword and custom dates. You want to export the calendar to CSV or ICS. You need Catalan or Indonesian translations. You have no issues with registering with the website. You wish the calendar page to auto-update and show the latest values. You want to search events by keyword. You are not bothered about too many ads occupying the calendar page. You wish to monitor nearly all the economic data of a country. You want to compare two events on the chart. You want auto-update of event values. You do not mind to register for creating a watch list, portfolio and real-time economic news. You are not particular about an event based filter. You are not worried about the impracticality (without registration) of selecting more than one country through the respective filter. You wish to assess the quotes of major Forex brokers at the time of announcement of data. You wish to study data based on specific events such as central bank interest rates. You wish to quickly know the number of scheduled event announcements in a day. You wish to track multiple financial markets at the same time. You need a continuous flow of data related to the economy of a country. You are not particular about printing or exporting the calendar. You can read and understand English very well, as the North American event data will be available only if the US English language is selected. You are willing to refresh screen often. You need an auto-update feature. You want customization of time zone either through cookies or profile. You are looking for a simple arrow based indication of the impact of the data on a currency. You have a limited knowledge of English and wish to see at least the basic details in your native language. You have no need for event filter. You are not bothered about the restriction on the list of events displayed when long duration is selected. You have absolutely no need to print or export the calendar. That is all for our 2016–2017 review of the top economic calendars. The research should help you in choosing the right Forex calendar for your analytical needs. Of course, you can always use not just one but several calendars that you have liked. Tell us how you use Forex calendars in your trading and which calendar is your favorite one! A big congratulations for this article. What an in-deep analysis of the pros and cons of all top Forex Calendars available out there. We are going to read it very carefully internally and find ways to improve our offering. I appreciate all the effort you put into the article. I am just wondering if you can jot down a few words on myfxbook calendar, may be just in a quick reply to this comment. Comparatively what is the biggest drawback of this one and does it rank in top 3,4 calendars? I am using this one at the moment. It is based on FXStreet’s, so everything applicable to FXStreet goes for myfxbook too. Oh, i didnt know that myfxbook is based on fxstreet. Cheers. The best thing I find about myfxbook is that it pops up a notification in a small rectangle … some one near the bottom of the page. that is just perfect. WBP online and even Trading economies unfortunately didn’t had NAB business confidence which really moved the market this week. Fxstreet, forexactory and most others have this. How do you know which source is faster? 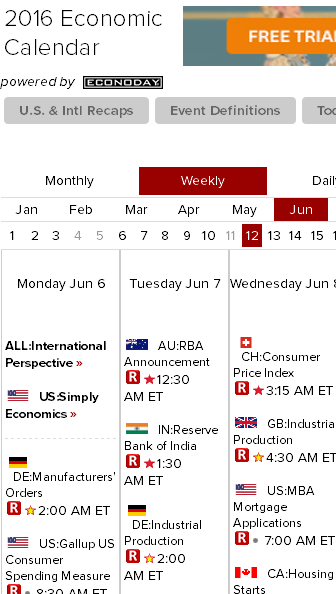 What comments do you have about http://www.mql5.com/en/economic-calendar? We did check a few releases (namely, NFP) manually to determine how fast the calendar gets updated. 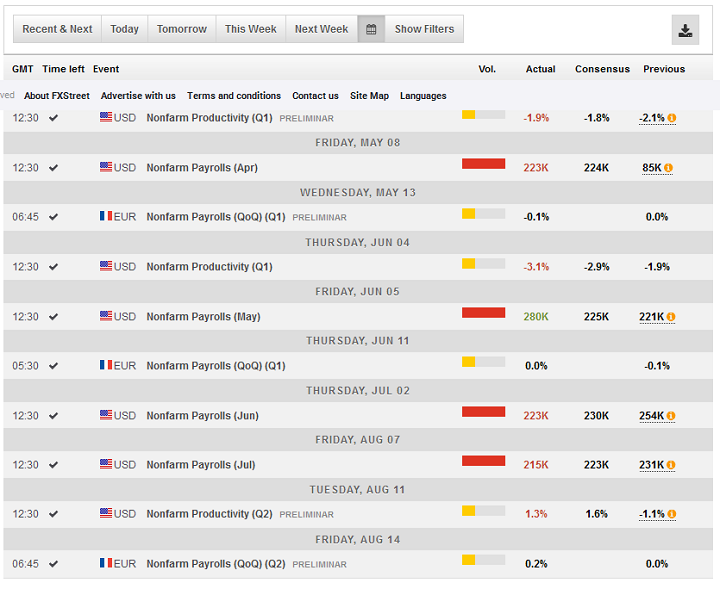 We will review MQL5 economic calendar during the next update of this comparison post. Thanks for suggestion! I don’t think it’s possible. Consensus forecasts take a lot of time to compile.